A Leopard cannot change his spots! How have three weeks flown by so quickly?! I also can't quite believe that I have neglected my blog for such an amount of time, well, I suppose I sort of can. Since my last post life has been pretty hectic, what with Halloween parties, spending some much needed time at home for a couple of days, panicking about Uni work, dressing up as a wartime troop entertainer and avoiding photo's due to sporting a rather large (and colourful) bruise/lump on my arm after my first time giving blood. After a very relaxing weekend, with some pretty amazing food (including my first Roast in 3 months!) and seeing my first ever Bond film, i've decided to pull my socks up and get back into blogging. I really, really love leopard print, particularly when it's featured in a sixties styled outfit, with lots of black, red lips and a beehive. So when Redfoot contacted me regarding their new a/w collection, I couldn't resist wearing their 'Bad Bardot' Leopard print pumps without harking back to the likes of Twiggy and Bardot (of course!) with a beehive and lots of black. As the print isn't too OTT, they make a plain outfit a little special, and i'm going to be brave and pair them with clashing prints as well. Eek! Redfoot are holding a competition at the moment for bloggers, with a chance to win £200 worth of vouchers and a chance to style your own photo-shoot, so take a peek! I know i'll definitely be entering! P.S. I have a very exciting interview coming up on my blog, from a very stylish lady who is on television quite a lot! Right, better get back to my evening of reading for a presentation I have coming up this week, cue a panicky Charlie. Ah thank you so much! xo. Thank you Sheri! It really does, doesn't it, i'm definitely entering! xo. Ah, I really need to get a bit braver and wear it more! They're so cute aren't they! Thank you lovely, xo. Love your coat so much!! Ah, thank you so much!! xo. such a perfect outfit! 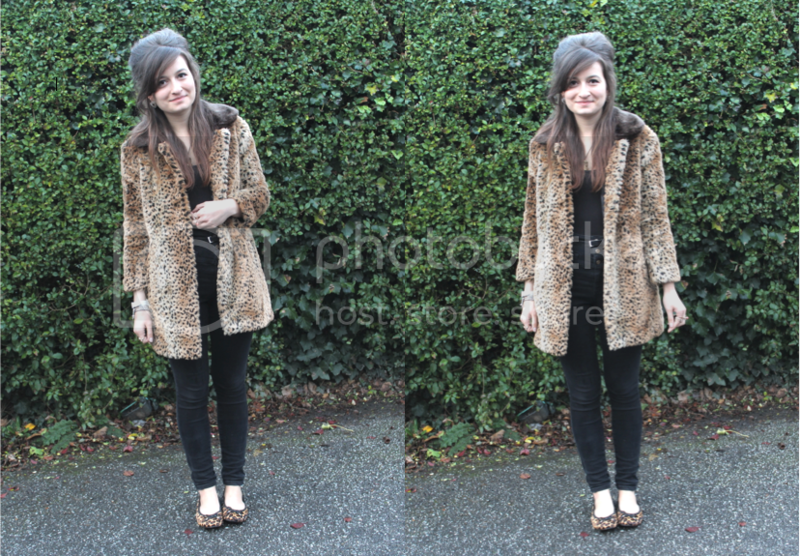 i need to hunt down a new leopard print fur coat for this year - mine is huge on me now. so upsetting! Ah thank you so much! Oh no, hope you manage to find one! xo. Ah thank you so much Katy!! xo. Ah thank you so much Catherine! I've only just started to wear it, need to get a bit braver, eek!! xo. 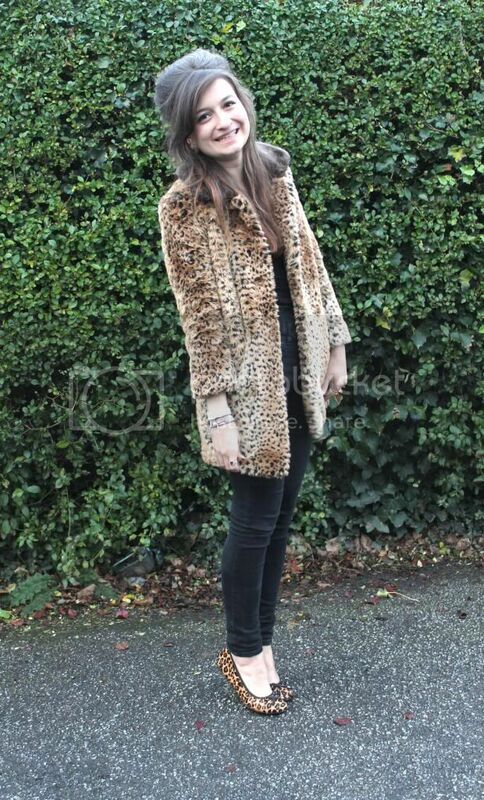 This is a beautiful coat, such a lovely leopard print! Is it this season RI? Also, really like how you paired them with leopard flats, i have a pair but have never been brave enough to wear them out. Ah thank you!! It's from last year, but it might be on eBay? Leopard print is always a classic when it's worn well, you look great! Ah thank you Beth! I really want to start wearing it more, xo. Ah thank you so much Charlotte!! xo. Ah thank you so much Michelle!! I'm good thank you lovely, hope you're well too and hope to see you soon! xoxo. Ah thank you Rachel, I still need to get a little braver to wear it to Uni haha! xo. You look amazing Charlie! Before I read your post I was going to say you looked like Brigitte Bardot! Eek, thank you so much, you're too kind!! xoxo. You are cute! Your hair is amazing too, wish I could master a beehive! Ah thank you so much!! It's really easy, just lots of backcombing!! You look amazing, the coat is so pretty on you. Ah thank you lovely! xo. Ah thank you so much! I need to get a little bit braver and wear it more, it's too nice not to! xo. absolutely love the coat! your hair looks lovely, too. Ah thank you so much Laila! xo. asdfghjkl so so perfect! i'm excited about this interview, when will it be up!? Eek thank you so much Lily, you're too lovely!! As soon as possible hopefully!! Ah thank you so much Julia! xo. So gorgeous! I agree, leopard print works best in 60s inspired looks :) Good luck for the presentation! it's really snuggly, but I defo need to wear it more! Need to tackle the nerves first, haha! xo. Oh Charlie you look absolutely stunning! Such a gorgeous outfit, I love leopard print :) Your hair looks amazing too, I've always wanted to be able to do a beehive! Ah thank you so much Holly!! You're so lovely, xoxo. You look aaaaa-mazing lady! Good luck with your presentation, you'll nail it! Thank you so much!! xo. Love your hair like that! Good luck hun! Thank you so much, xo.